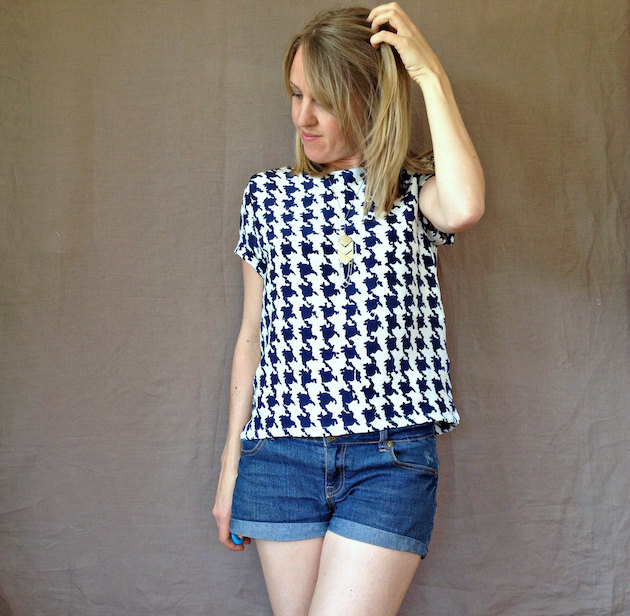 The Inari Tee by Named Clothing. 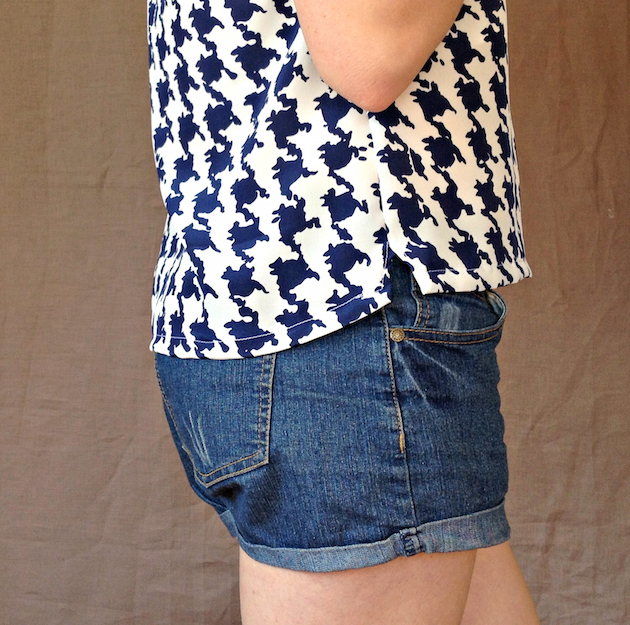 It looks like a boxy top but is actually beautifully fitted, which makes it flattering in all the right places. Not that I’ve made the dress version yet, mind you. The Inari comes with crop top or dress options, side slits, cuffed sleeves with a relax-fit and neck facings. I’ve opted for a crop top version here with a whopping 14cm added to the length (I slashed the pattern just under the arms to add the length). I didn’t need to make any alterations and the instructions seemed well written. The fabric is a semi-sheer silk (try saying that three times quickly! ), so I swapped out the neck facings for a short bodice lining which stops just below my ribs. This was partially due to a lack of white lining fabric, but it’ll keep the top airy during summer too. I also had to make the back lining from two pieces, so sewed them together used a flat felled seam to minimise bulk. It’s my first make using Named Clothing and they were great … but my one complaint would be that the patterns weren’t nested, so if you needed to merge sizes you’d be in for a wild ride (edit: April 2016, they updated their patterns to now be nested. Hooray!). And you can only print two pattern sizes at a time. Boo. Otherwise the instructions were well written and the fit is amazing. (Another edit: I purchased a PDF pattern, but I believe the printed patterns don’t include seam allowance? The PDF did include them and was fine, but it’s worth noting). I found this navy houndstooth silk at The Fabric Store and every time I opened my stash, I’d look at it, torn between wanting to wear it and not wanting to ruin it. I knew I’d have to use it sometime, before the moths ate it or little fingers stained it. I’d be sad then. Sad that I hadn’t enjoyed it first. So I caught a vision, downloaded a pattern and made myself jump in. Actually, I needed a little shove to get started and I owe a big thanks to my Instagram gals for cheering me on. Thanks ladies!! Without you I’m sure I’d probably still be unsure. Of course, before launching in with my precious fabric, I did a trial run with pink polyester remnants. I’ve already worn it several times! ‘Muslins’, or trial runs, are much less tedious when there’s actually a chance you’ll wear them. I highly recommend it. So, do you have some precious fabric in your stash that needs transforming? Maybe it’s time to catch a vision and start enjoying it. Let me know and I’ll cheer you on! Or maybe you need more time. That’s ok. But don’t leave it forever. Fabric doesn’t last that long. Love this as a top. I want sure about the cropped version but the extra length really works! How tall are you? Just so I can roughly guage how much to add if I did make this. It’s turned out so well. I’ve a few special pieces that I too stroke and dream about. I’m so tempted to try this in the dress but I’ve so many other patterns…. I’m wondering if I can cocoon something I’ve already got…. Look forward to your dress version! Yes, you probably could! I think what really works with this is the nice fit in the bust area which stops it looks too sack-like, then the cinched in lower half for the cocoon shape. Certainly worth a try! Oh it sounds amazing! It’s even harder to cut into something that carries sentimental attachment. I have some clothes from my late grandmother to refashion but I can’t bring myself to do it yet. Can you share a photo? I’d love to see it. Maybe over on The Fold Line? Oh I have plenty of silks I’m terrified to cut. I love them & I panic that I won’t use them on something ‘worthy’. Stupid I know! In fact I’ve been trying to decide whether to cut up some lovely silk for an Inari dress or a Flutter tunic… It’s killing me! That was exactly my dilemma! The fear of both using them and not using them. It’s stressful! I’m so happy with the result though. Phew! Good luck with your decisions & sewing!! after seeing sew busy lizzy’s dress and your top, i jumped in. 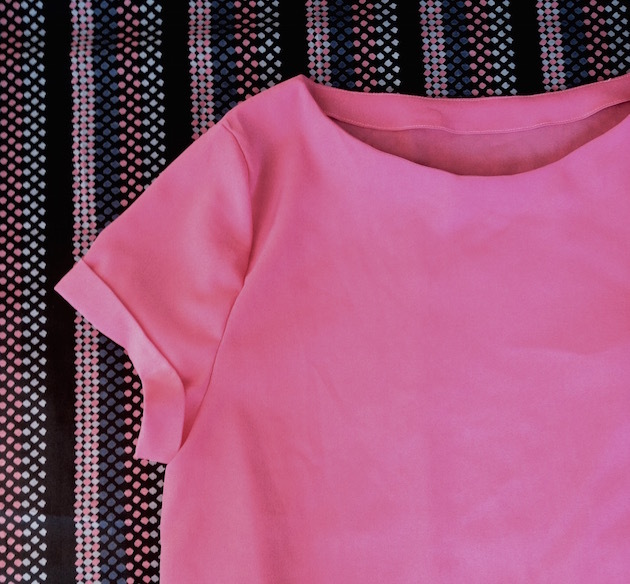 i made the crop top and only added 1″ (around 2.5 cm) out of a loosely woven rayon and consider it my muslin. i’ll add more to the length when i make it out of a nicer fabric. i made the US 6 and it fits perfect through my shoulders and bust. next up, i’ll try the dress out of a really nice piece that’s been in my stash for several years. thanks for the review. 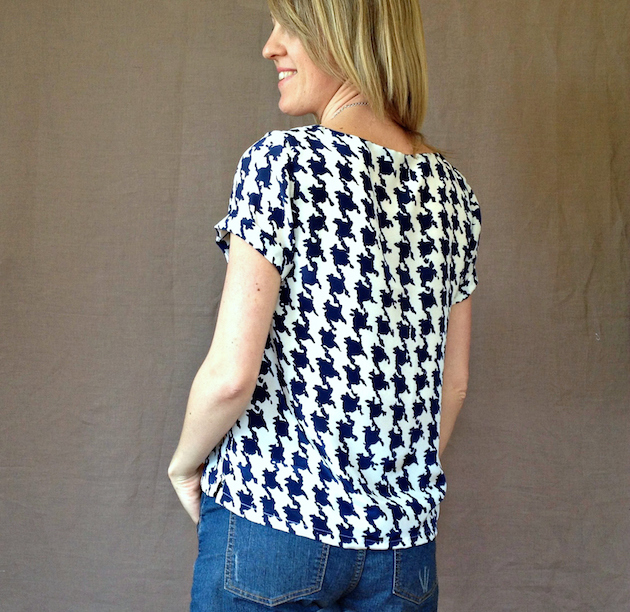 Love the Houndstooth fabric and how the top turned out.